Mangini is also a veteran, as he served with the U.S. Army’s 82nd Airborne Division in the late 1970s. 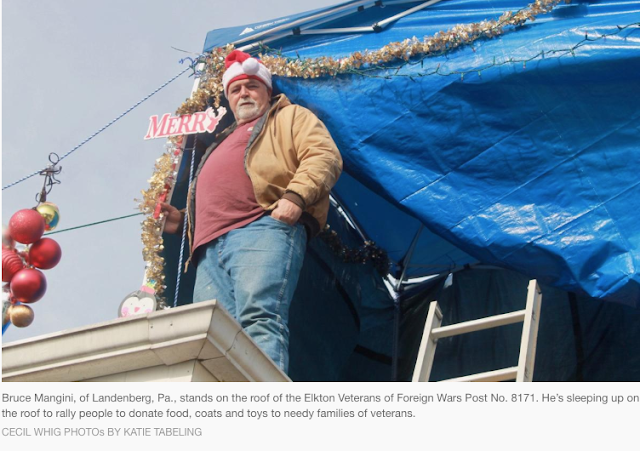 In his own way, living up on the roof during Christmastime is a way to pay tribute to those in the military who are currently stationed in Afghanistan, Iraq or other far-flung places. Mangini himself never served overseas, but said his tent is “a mansion” compared to what he lived in while training. He’s willing to bet his current living conditions are miles better than active-duty troops. ELKTON — He has eyes that twinkle and a beard as white as snow. But unlike the Santa Claus described in “The Night Before Christmas” that shimmies down chimneys to leave presents, Bruce Mangini, of Landenberg, Pa., plans on staying on his rooftop until he can rally enough people to fill his “sleigh” with toys for families of veterans in need. To protect himself from the wind and rain, he built a tent out of tarp and a blue gazebo and sleeps under an electric blanket on a cot his grandson chose for him. He comes down on occasion to walk around, per his doctor’s orders, and to go into the VFW to use the bathroom. But for the most part, Mangini stays on the roof — and he’ll come down for good when his 12 days are up or when his trailer, parked nearby, is filled with toys, coats and non-perishable food donations. Mangini likes to participate and organize charity events in the tristate region, like a motorcycle ride to fundraise for the Domestic Violence Center of Chester County, Pa., or coordinating with his cousin on a cookie baking and giveaway for veterans. But he’s always gravitated to Elkton after he established a friendship with Commissioner Mary Jo Jablonski and her family. After working with the Elkton VFW for other toy drives with the Steel Horse Guardians, a nonprofit charitable group of motorcyclists, he’s felt the need to continue paying it forward to Elkton.